If I’ve said it once, I’ve said it a thousand times: never underestimate the power of Red. When doing some Thursday sipping at Sunfish Cellars, the manager, Erica, suggested I try a “fun wine” called Made by G. While I’m always up for “fun wine”, I’m not a huge fan of Gamay (also known as Beaujolais) so originally, I passed. To my taste, Gamays tend to be a bit light and, well, dull, mostly because they lack the depth and flavor red wine gains from the aging process. After gorging myself on a lovely flatbread pizza of garlic sauce, spicy salami, tomatoes, pepperoncini and mozzarella followed by a red wine flight, I wanted something sparkly to clear the pallet of spice and heavy red wine. I decided not to be so obtuse and ordered a glass- what did I really have to lose, right? To my delight, it was just what I was looking for. What’s more, I believe it’s what several of you are looking for in a New Year’s Eve wine. Made by G is bright red with a celebratory effervescence. It’s both fruity and tart, reminding me of sour cherry balls. Alas, it has some structure and made my lips pucker, so it wasn’t too sweet and fruity (looking at you Bartles & Jaymes). The bubbles cheered me up, the tart cherry made me think of childhood delights. It then dawned on me: I needed to be ringing in 2013 with this wine. I chatted with a couple Sunfish regulars, telling them about how pleasantly surprised I was with this Gamay and how I think they’d dig it, too. The gals decided to share a glass. Not only did they enjoy it, they went next door to the wine shop and each bought two bottles! How’s that for a ringing endorsement? Trust me on this: if you’re not going with [my tried and true] Prosecco on New Year’s Eve, stand out from the New Year’s crowd with this red, sparkling number. Drink it chilled as this wine will be enjoyed by both white and red drinkers alike. Heads will turn and you’ll be the hit of the party! This bottle is priced at my “Snob wine of the month” category but this is NYE and I figured we are worth the splurge this week! 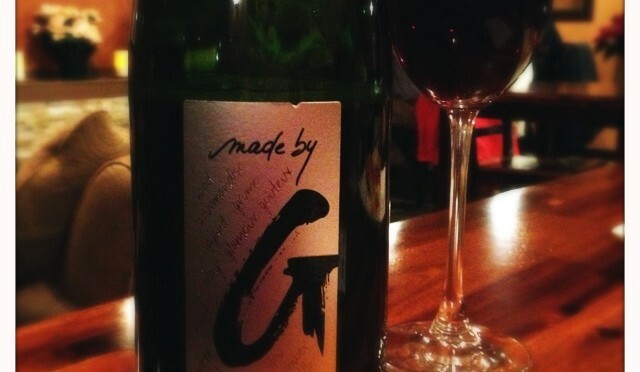 Made by G is a sparkling Gamay sure to titillate your senses & pucker those kissable lips! Love this wine and enjoy your webpage. Can you help me secure this wine in San Diego California? Having trouble finding it. Best of luck, I hope you found this wine by now. So delicious!